I started this out by trying to find what the boundaries of Frankford really are. A news report this week identified the 2300 block of Orthodox Street as Frankford. When I grew up in Bridesburg in the 50s we considered that part of Bridesburg. So I started looking around and found that there are no official boundaries of Frankford because there is no official Frankford. Frankford may be a zip code or a census tract or an idea in somebody’s mind but that is as close as we can get. Which brings us to this map. It is from the Gopsill’s 1901 map of Philadelphia. I like this map because it shows Frankford in the period before the development that changed the original town. Most important thing to know is that the street lines that are shown as dashes are proposed. they were not built in 1901. Five points was what we now call Oxford Circle. Dark Run Lane is now Cheltenham Avenue. The intersection of Orthodox and Ditman (my great grandfather’s grocery) is there but Torresdale Avenue did not exist. Click on the map to get a larger image. The Historical Society of Frankford has many others of much better quality. A new season of programs will begin in September. 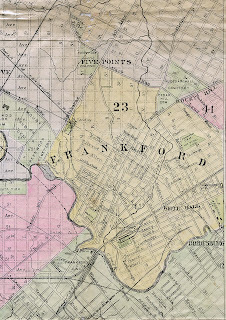 1 Comment on "Frankford 1901"
Gil, the “official” borders of Frankford would be those that were in place prior to the 1854 consolidation of all Philadelphia County into Philadelphia City limits, back when Frankford was an actual borough, with it;s own Town Hall. Please contact the Historical Society of Frankford for a that “official” information!